Nineteen people have been taken ill after an Emirates airline plane landed in New York, officials say. 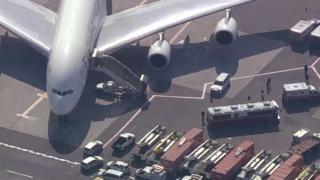 The plane was quarantined at JFK airport as those on board were checked by health officials. Eleven went to hospital but others declined treatment. The US Centers for Disease Control and Prevention (CDC) said that initially about 100 people including some crew had complained of illness. Flight 203 from Dubai landed at 09:10 (13.10 GMT) with 521 passengers. Emergency vehicles were seen on the runway as it landed. Singer Vanilla Ice, who also said he was on the plane, posted video of the emergency response on the tarmac. Soon afterwards, Emirates airline tweeted that the sick passengers were being attended to and those who were unaffected would be allowed to leave the plane. In a statement, the CDC said: "Approximately 100 passengers, including some crew on the flight, complained of illness including cough, fever, and symptoms of gastrointestinal illness. It said that after completing health evaluations on everyone on board, 538 passengers had been released and 11 people were taken to a local hospital for care. "Passengers who have been evaluated and released [should] call their provider and health department if they develop any symptoms," the health body advised. Media captionDubai Emirates flight: "All of his friends are sick"
A spokesman for New York's mayor, Bill de Blasio, said that some of the passengers had originally come from the Saudi Arabian city of Mecca, which was currently experiencing a flu outbreak, and that the passengers' symptoms were "pointing to the flu". Larry Coben, a passenger on the plane, posted pictures on Twitter of unaffected passengers being checked as they disembarked. 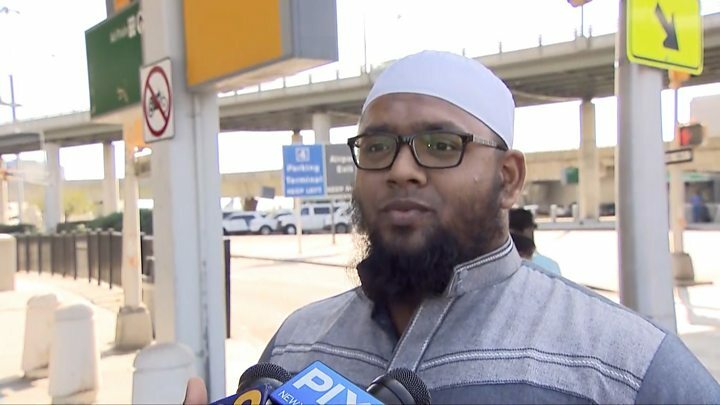 ABC News reports that the pilot raised concerns prior to landing that some of the passengers were coughing and experiencing high temperatures. Another passenger, Erin Sykes, posted a video of officials wearing protective clothing checking passengers over as they disembarked. A government official told US news outlet CBS News that "there was no evidence of a security or terror issue". A business class traveller, Raghida Dergham, told CBS News that the sick passengers had been sitting in the economy section of the plane.